Fender completes the first generation of its Mustang amplifier line with the introduction of the high-powered Mustang III, IV and V models. Like the smaller Mustang I and II models released in late summer NAMM 2010, Mustang III, IV and V raise the standard for modern guitar versatility and muscle, with incredibly authentic amp models, a huge bank of built-in effects, easy USB connectivity and Fender FUSE software, all packed into a striking visual design with sleek and modern Fender black “carbon tweed” covering and silver grille cloth. 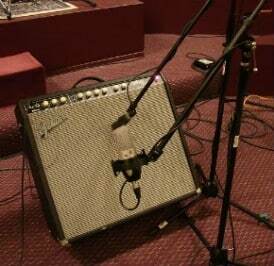 Mustang series guitar amps offer up-to-date features and loads of fun at unbelievable prices. Aimed at guitarists from beginner to weekend warrior, these high-performance machines contain highly accurate amp modeling, a stellar collection of effects courtesy of an all-new DSP platform, and many “hidden” capabilities, yet they are easy to use right out of the box! The visually striking design treatment looks all new, yet evocative of classic Fender styling. And with loud, lightweight power amp designs and muscular speakers and cabinetry, they sound as good as they look. 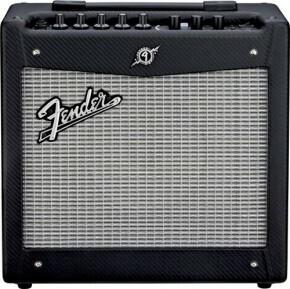 The Fender Mustang is a closed-back combo with a special design speaker. The amps come factory loaded with 24 presets built from 8 amp models and 24 effects, with tones from vintage Fender to modern Metal. The number of amp models can be increased with the use of a computer, and this amp can be completely reconfigured by the user. Why do I hear people talking, like on an AM radio, when I turn up my Fender Sidekick 25 (SKX25R) really loud? The distortion is too loud for me to understand them. Also, I bought it used. How much was it new? Without actually hearing the voices I would suggest you make the following checks: Make sure you’re using a good quality shielded cable intended for guitar. Screw off the cable ends and look for either the foil or braided “shield” which signifies a cable intended for this use. Check if the shield is soldered well to the plug. Do you have single-coil pickups? If so, that could be the problem right there. Single coils, especially if they’re of poor quality, pick up all sorts of radio crud. It’s possible that the amp itself is susceptible to RFI (radio frequency interference) because of poor shielding or just massive amounts of gain. RFI can sometimes be extreme in certain locales. Do you live near a radio station or Ham operator? Bring the amp to a friend’s house and see if it’s any better. Finally try and listen closely to the radio voices; are they speaking directly to you? Unt how long have you had this problems? 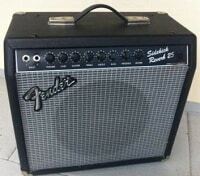 The amp was $249.99 new.